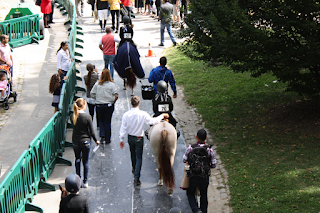 I've made made several trips to NYC, but this was my first visit to Central Park... and for a horse show no less! It was the first year to introduce the hunters at the Central Park Horse Show and from what I saw it was a huge success. 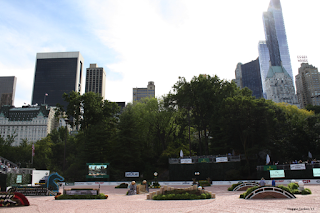 First of all, the Rolex Central Park Horse show in itself was amazing. It is the heart of the largest city in the United States, yet it had an intimate feel. It's almost as if you entered a movie set. The attention to detail was noticeable and the backdrop of the city was magical. The tear-dropped ring contained a traditional hunter course that was uniquely NYC. 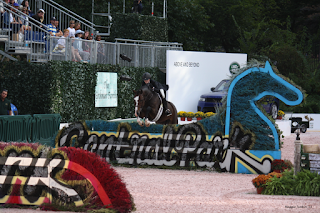 The course designer, with the help of a street artist, blended urban style fences with the traditional country style of the hunters. One fence was designed to look like the Brooklyn Bridge, another was painted with the NYC skyline and curved stonewalls looked like Central Park bridges. Traditional brush, hay bales, and log jumps were transformed into painted street art. 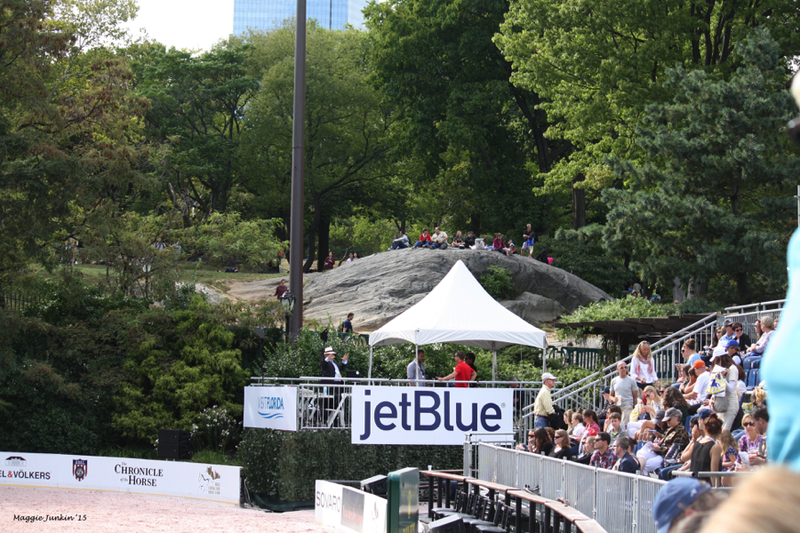 Most horse shows are fairly large venues filled with equestrians in a country setting. The thing that made this venue unique was it is in a small setting with a busy urban life going on around it. I enjoyed watching the rock hills surrounding the show ring. People would gather as spectators. There were many people picnicking. I saw several weddings and a modeling shoot taking place. People picnicking near the ring. 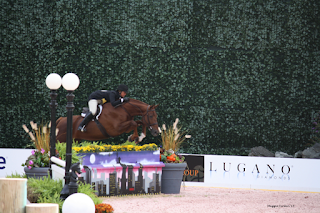 There were three hunter classes held on Saturday: the $1,000 Small/Medium Pony Hunter Classic, the $2500 Meralex Junior/Amateur Owner Hunter Classic and the $50,000 Duchossios Cup presented by the Gochman Family. 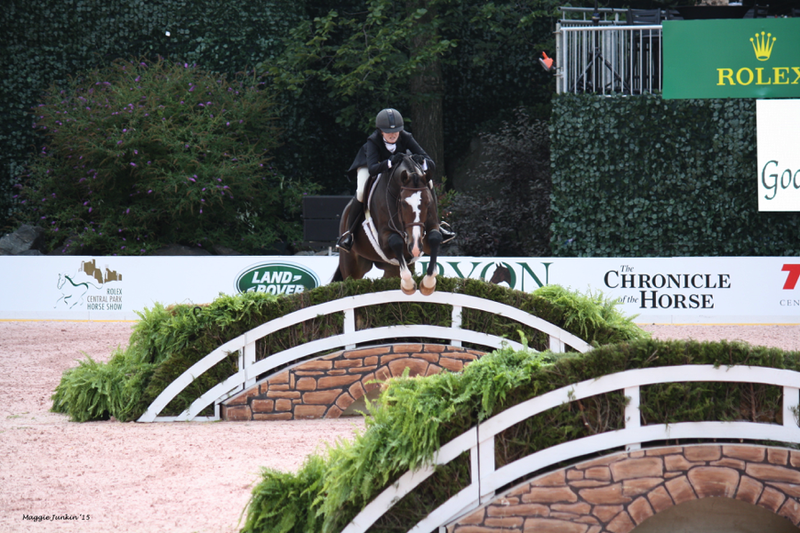 As a pony rider I enjoyed the Pony Hunter Classic. I really loved how each rider rode to a musical piece of their choice. They chose a song that best represented them. My favorite was Deep in the Heart of Texas, the song chosen by Tessa Downey. Tessa and her pony Grand Jete’ came all the way from Houston, Texas to take part in the Pony Hunter Classic. Tessa Downey and trainer, Peter Pletcher, head up to the ring. My close second favorite was the oh so appropriate, Welcome to New York, chosen by Mimi Gochman from NY, NY. Mimi rode the adorable pony Love Me Tender owned by Dr. Betsee Parker. 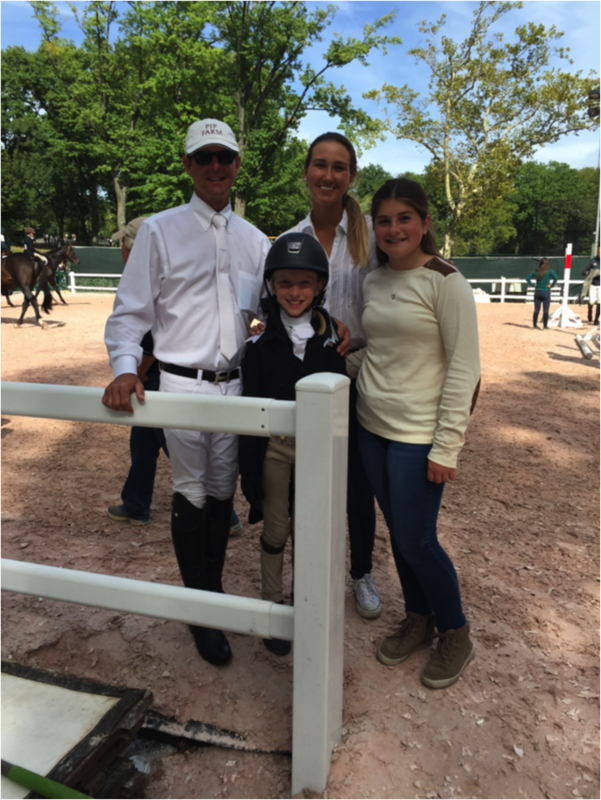 Sophie Gochman was the winner of the Pony Hunter Classic. Sophie rode a fabulous round with Bit of Love, owned by Dr. Betsee Parker. 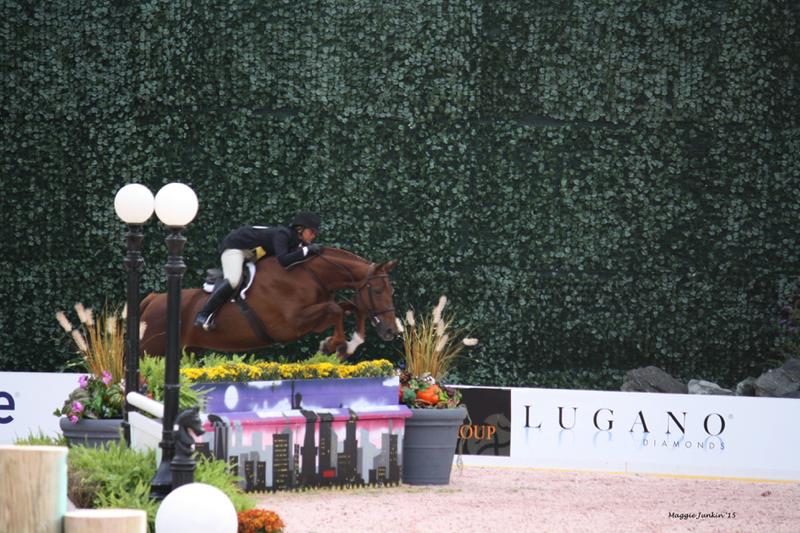 Following the Pony Hunter Classic was the $2500 Meralex Junior/Amateur Owner Hunter Classic. Givanna Rinaldi led the class with Taken, owned by Jessica Stitt. The final hunter class of the day and my favorite was the $50,000 Duchossios Cup. It was an exciting event to watch with ten of today’s leading hunter professionals and their incredibly talented horses. That list included Kelley Farmer, John French, Scott Stewart, Louise Serio, Maggie Jayne, Peter Wylde, Jennifer Alfano, Peter Pletcher, Amanda Steege and Elizabeth Boyd. It was Jennifer Alfano that took the win with Miss Lucy, a mare owned by Helen Lenahan. After the hunter classes we had a chance to shop in the vendor area, buying some souvenirs to take home. The excitement of the day continued into the night. 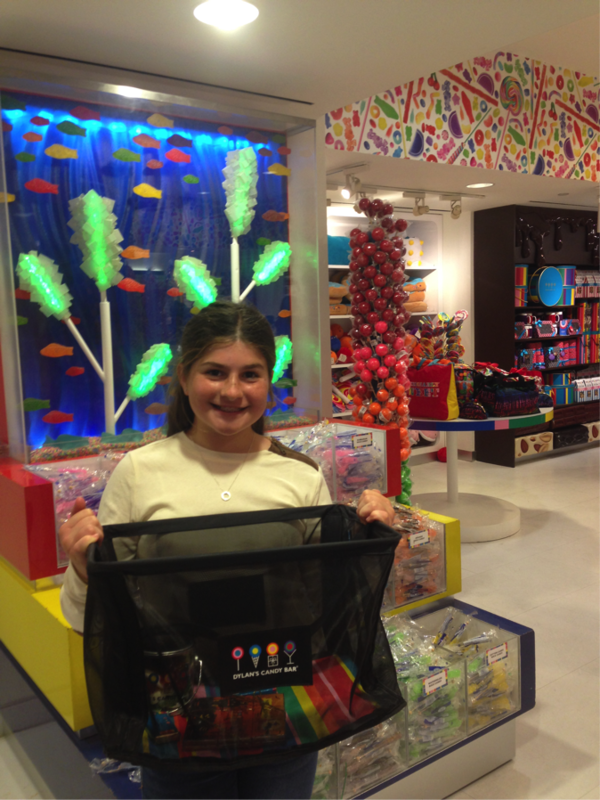 We made a visit to Dylan’s Candy Bar and had dinner at a fabulous restaurant. Later we took an evening carriage ride. As we toured the park we passed the now empty horse show grounds all lit up in the dark and we could hear the Coldplay concert playing near by. This city truly never sleeps! I was sad to see the day end, but it was time for us to return home with the hopes that they bring the hunters back again next year. Maggie Junkin is a 12 year old who competes in the large pony division. She is committed to animal rescue. Her favorite rescue to support is Danny & Ron’s Rescue. She lives with her family, 5 dogs and 3 cats in Jenkintown, Penn.